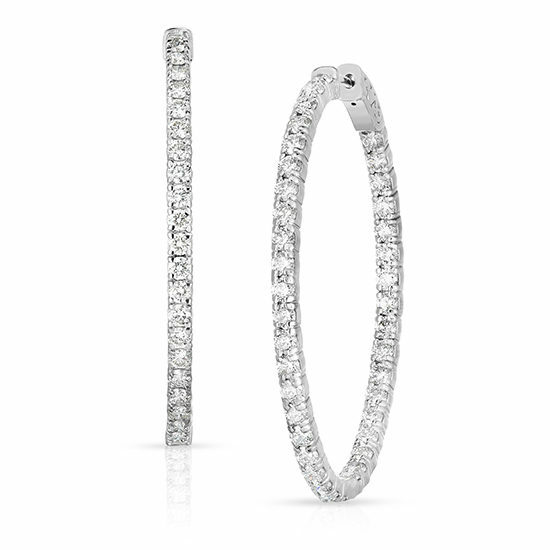 Beautiful oval shaped diamond hoop earrings. Each hoop earring contains 39 perfectly matched 6 point diamonds for a total of 78 diamonds in the set. These earrings were meticulously crafted in 14k white gold. The diamonds are prong set with four securing each diamond in place. The total carat weight is 5.14 carats of diamonds. The earrings are 2 inches high and 1.5 inches wide. Available for purchase in store and online.